Welcome to Salem Off Road Online! Please take a moment to browse our website. We are currently developing our online store, meanwhile, our retail store offers a plethora of aftermarket accessories and can provide you with all your aftermarket accessory needs. 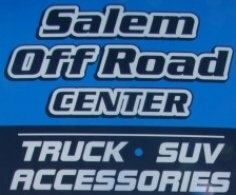 Salem Off Road Center strives to deliver the best in high-value, low-priced products. Designed and created by Squatch Web Design.